Any one astrologer who regularly does charts for clients must go through the sometimes-difficult process of preparing a good, helpful, meaningful experience. It’s important to have a well-organized approach to it that allows you a regular entry into guiding and developing the occasion. 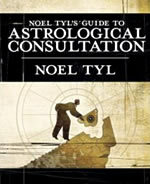 Noel Tyl’s latest book provides a choreography, a clear-cut process, to preparing the horoscope and seeing its development through to client discussion. This choreography works step-by-step to adjust the mind to the best way to build analysis and communicate it meaningfully. The more the choreography is repeated — the more cases prepared the same way every time — the more the brain’s circuitry grooves the ways for its best performance and rapidly creates sureness! How to see past development times and future projections with ease. Within this assembly process — getting all the blocks of consideration lined up knowingly and routinely — you discover in the process that your eye and brain are much, much faster than the computer. In fact, after the computer gives you the information you need, the same way for every case, you may be amazed at how much you add and develop toward top-flight professional insight. It’s true: when you look around — if you know how — you see a lot. To get a real-time feeling of how it’s done, there are five verbatim, full-length consultation transcripts, with Tyl’s thoughts behind key conversational maneuvers included. The process of analysis continues: a new Therapy Flow orientation leads you to doing good work with the client. Transits and Solar Arcs highlight developments past and future, as a theme emerges from the consultation conversation, and the last five minutes of each consultation become eminently memorable. Definitely an important addition to the library of anyone who is looking to become — or already is — a consulting astrologer.